EMI in Europe has announced it is issuing (on 7 December) a limited edition boxed set of four of the new stereo remasters called The Beatles Christmas Pack. The Beatles "Christmas Pack: Limited Edition"
The set will contain “Rubber Soul”, “Revolver”, “Sgt. Pepper’s Lonely Hearts Club Band” and “Abbey Road”. 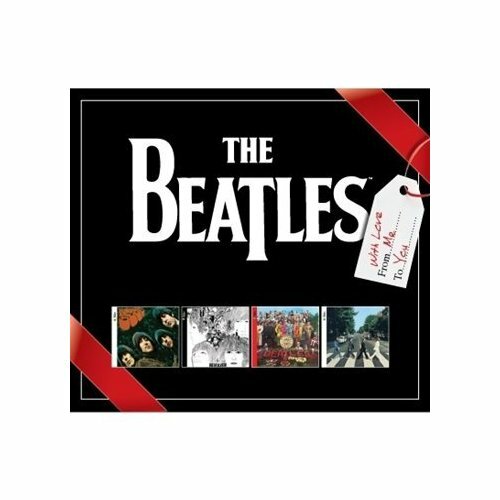 Each album will include the bonus “Making Of” video that uses exclusive original footage from the Beatles’ own archive plus other rare footage and voice-overs by the Beatles and George Martin. This entry was posted in Beatles, Beatles Collecting, Beatles Music, George Harrison, John Lennon, Paul McCartney, Ringo Starr and tagged Abbey Road, Beatles, Beatles Christmas Pack, Beatles Collecting, Beatles Remastered, George Harrison, George Martin, John Lennon, Music, Paul McCartney, Revolver, Ringo Starr, Rubber Soul, Sgt. Pepper by beatlesblogger. Bookmark the permalink.